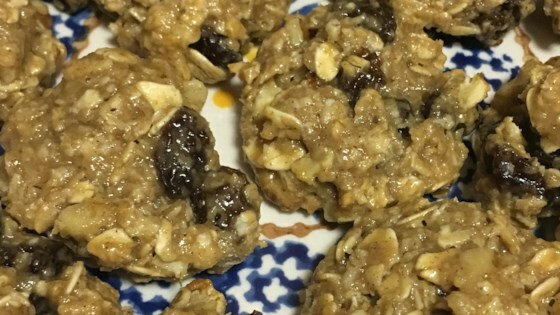 "This cookie recipe uses tahini (sesame seed butter purchased at a health food store or home made), also uses oatmeal, no flour, no sugar, no eggs and no dairy products. As variation, add chopped apples, raisins or dates." In a medium bowl, stir together the tahini, honey and cinnamon. Mix in walnuts and oats until well blended. Drop by teaspoonfuls onto the prepared cookie sheets. Cookies should be about 2 inches apart. Bake for 10 minutes in the preheated oven, or until edges are slightly brown. Cool on the baking sheet for a few minutes before removing to wire racks to cool completely. These amazing tahini cookies are chewy and delicious without eggs or dairy. This is so easy to make plus being absolutely delicious. It's also special for people who can't eat flour, sugar, eggs, dairy products, corn, or soy.